This month is not quite a "Real Liverpool Wedding". This month Kara and Dennis were married at the Wrightington Country Club and Hotel in Wigan. Kara chose this beautiful mix of colours, using blue, purple, lavender and wine in a rustic, just-picked country style theme. Her wedding flowers consisted of a semi-wild bridal bouquet, with a gypsophila bridesmaid bouquet to compliment it. The groom had a beautiful just-picked semi-wild buttonhole too and the mother of the bride had a matching wrist corsage. 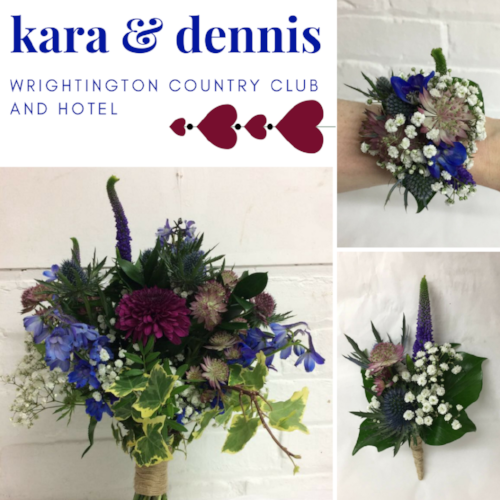 The wedding flowers were a mix of delphinium, crysanthemum blooms, eryngium, astrantia, veronica, gypsophila and ivy foliage.